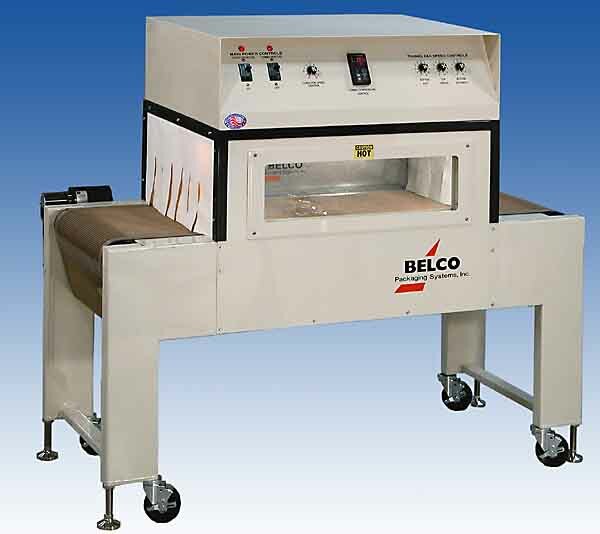 Shrink wrap equipment is available in several types including semi-automatic L-sealers, automatic L-sealers, high speed side sealers, horizontal flow wrappers, and sleeve wrappers. Naturally in order to shrink the film, we also offer a great selection of heat tunnels and accessories to match the needs of your shrink wrapping application. 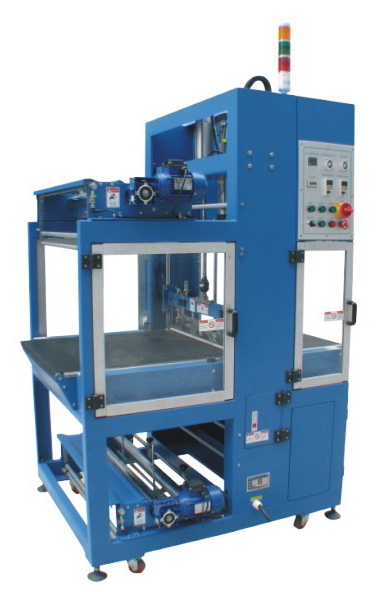 Our most popular shrink wrap machine is the Shrink Wrapper and Heat Tunnel Combo. These systems are built on a single frame on casters which makes it easy to move around to the packaging area when needed, or to move into storage when not in use. 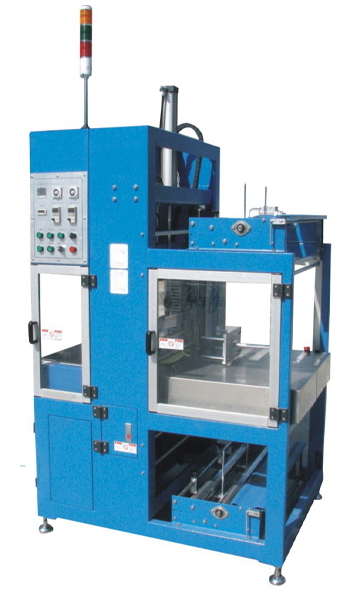 Available in two sizes and many options, these are great heat shrink wrap machines for production of up to 15 packages per minute. Main Power Switch Turns on/off the power to the entire machine. Maintains all previously set tunnel adjustments which assures rapid start up and consistent quality at the beginning of your next shift. Heater Switch This switch allows the heaters to be shut off at the end of your production run without having to change temperature settings. This expedites start up and assures quality control. In addition, it facilitates machine “cool down" by allowing the tunnel fans and conveyor to run until cooled. Variable Speed Conveyor Control Allows you to adjust the conveyor speed to obtain the best quality “shrink" for your products regardless of their size or shape. Digital Temperature Control Ensures consistent and uniform shrink quality by virtually eliminating any temperature fluctuation within the shrink tunnel. Presents a dual display read-out of both actual and set-point temperature to provide an accurate visual indication of tunnel temperature conditions. An added benefit of digital control is it minimizes setup and changeover time to further increase productivity. Adjustable Fan Speed Controls Allows independent adjustment of air flow over all surfaces of your package. 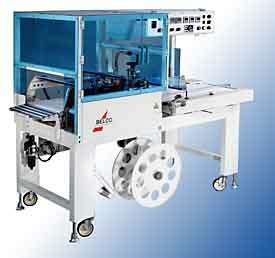 This assures quality shrink packaging plus maximum flexibility, no matter what the size or shape of your product. Teflon Mesh Conveyor Belt This durable, non-stick belt is ideal for very small packages or multi-packs. The design of the mesh belt facilitates even air flow to all surfaces of your package and is essential when your product must be transported smoothly through the tunnel. Constant and Impulse Sealing This switch allows the operator to choose the optimum sealing condition necessary to produce fast, strong seals depending on which commercially available film is used. Impulse Time This time control monitors how long the element wire gets hot. Seal Wire Heat Adjust This control determines how fast and how hot the seal wire will get, allowing for maximum sealing speeds. Sealing Wire Sensor This unique switch prevents the sealing wire from overheating during the seal cycle. By sensing the correct seal wire temperature, fast, clean seals are obtained. 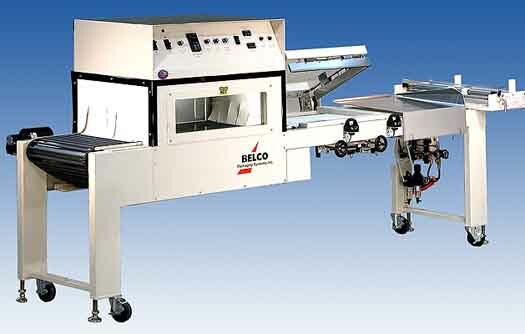 You can expect longer seal wire life and reduced wear and tear to the sealing head assembly with this proven Belco System. Film Roll Cradle No tools are necessary to quickly change film rolls or sizes. This heavy duty film cradle has adjustable side guides to position the film and a film unwind brake to adjust how fast the film unwinds. A film splitter bar helps open the center fold film. Infeed Tray The aluminum infeed tray with Film Opening Horn assures easy product loading into the film, maximizing your productivity and minimizing operator fatigue. Seal Arm Guards These guards clamp the film in an even and positive manner to reduce film tension during the sealing process and help insure quality seals. Magnetic Clamps Rather than using adhesive tape, magnetic clamps allow your operator to quickly change and maintain the bottom seal sponge and Teflon. In addition, it allows for flipping and reversing both of these wear items to prolong their life and lower your operating costs. Adjustable Tilt Sealing Table The product sealing table or optional take-away conveyor can be raised, lowered or tilted to allow smooth transfer of your product out of the seal area and into the tunnel. Heavy Duty Locking Casters Belco STC’s are mobile. You’ll find them easy to move from one production location to another assuring maximum production flexibility and productivity. Leveling pads are standard on all models. Welded Frame Belco STC’s are built to last. You can depend on years of trouble free production. 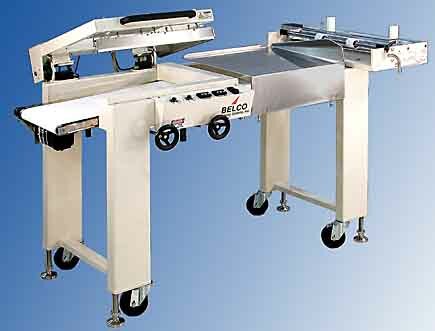 All Belco Sealer-Tunnel Combinations start with the same premise…a heavy wall tubular steel welded frame. Solid...nothing to loosen up…nothing to become misaligned and cause unnecessary wear and downtime. Magna-Lock Sealing Arm System Powerful magnets hold down the seal arm to provide semi-automatic operation and even seal pressure along the entire seal base. The adjustable timer provides the correct dwell time necessary to assure consistent, strong, quality seals. Air-Operated Seal Arm Dual Opto-Touch start switches begin the seal cycle and greatly reduce operator fatigue while creating the best seals possible in semi-automatic mode. Live Roller Chain Conveyor This conveyor is composed of 3/8” diameter rods, sleeved in silicone rubber and assembled on 1-1/2” centers. Useful for packages heavier than 5 to 7 pounds which may tax the Teflon mesh conveyor belt and for applications where optimum shrink quality is required. PLC Controlled Operation Once the dual Opto-Touch start switches initiate a seal cycle, the PLC program lowers the sealing arm under low pressure. When the seal arm reaches the base, valves switch to high pressure for the sealing cycle. Power Take-Away Conveyor Once the seal is complete, the arm raises and the product is transferred out of the sealing area. An adjustable timer controls how long the conveyor moves the product, either all the way out of the seal area or just far enough to make the next package. Powered Film Unwind This motorized film cradle feeds film to the operator upon demand as the package is advanced into the seal area. Regardless of how fast the operator or how long or small the product size, this option can maximize production speeds while minimizing operator fatigue. Adjustable Film Inverting Head By turning film inside out in a 90° manner, an in-line packaging operation can be created to significantly increase production flow, lessen product handling and increase operator efficiencies. The adjustable height inverting head opens the film for the operator to help reduce fatigue. This feature also minimizes the amount of film required to wrap your package and eliminates the need to buy additional fixed heads for your other package sizes. Hole Punches Air evacuation devices come in several styles to best fit your machine and application. Choose pin-wheel, thermal, electro-magnetic, air or multiperf for your machine. 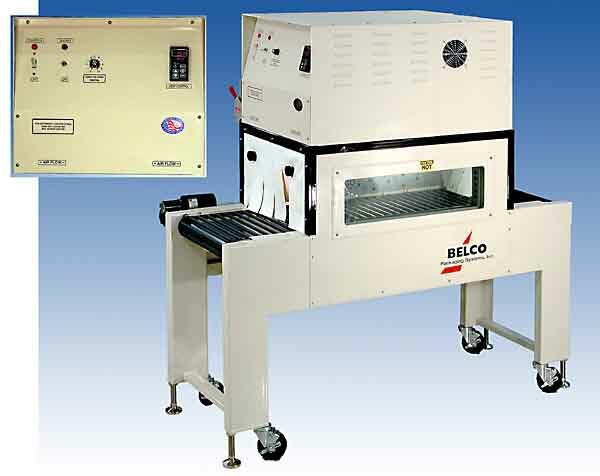 Some customers who already have an existing Heat Tunnel or who run sizes of product outside the range the more popular combination shrink wrap machines need an independent semi-automatic L-Bar sealer. Below please find a listing of stand alone L-Sealers. All have the same basic options available as shown above (except heat tunnel options). 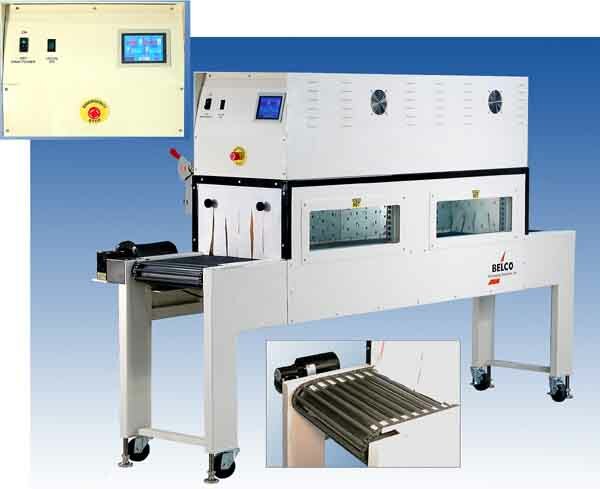 Automatic L-Sealers offer the ability to run at speeds up to twice that of Semi-Automatic machines in the range of 25 - 35 packages per minute. Automation speeds can again double up on a continuous motion side sealing machine with speeds of 50 packages per minute and more. The variable speed infeed conveyor can be adjusted to accept upstream product without an operator even if it is spaced back-to-back or with intermittent gap spacing. The FEN will correctly read and seal between products which also allows the machine to seal random length packages. Narrow width products and very long packages can now be wrapped as easily as more traditional sized items. The machine's PLC based control system with color operator interface can store up to 30 recipes to assist your operator in making fast and accurate product change overs. Designed to operate on 120 volts, this compact machine will accept a wide variety of products and is built to deliver repeatable performance. Standard belted and flighted infeed conveyors. Exit and transition conveyors for product over 36" long. Light curtain sensing device for irregular shapes. FDA approved infeed and exit belts. Two styles of shrink tunnels make up the product line: our “Fan Style / Convection Oven” tunnels and our industry leading “Re-circulating Air” models. Convection works great on most products up to 25 packages per minute. For higher speeds or in cases where precise heat control and/or directed heat is required Recirculating Air models are the best choice. 18" x 24" x 8"
28" x 41" x 57"
21" x 36" x 8"
32" x 61" x 57"
30" x 48" x 10"
29" x 61" x 64"
35" x 74" x 66"
35" x 74" x 70"
46" x 92" x 68"
44" x 72" x 10"
These tunnels will handle all commercially available shrink films, including polyethylene. For production speeds of five up to 150 packages per minute. 22" x 72" x 10"
Sleeve wrapping machines are distinguishable from other types of shrink wrap equipment in that the two ends of the package have an opening such as commonly seen for water bottle packaging where the openings can act a handles. In point of fact a sleeve wrapper is an excellent solution for bundling a wide variety of products and is often called a "bundler". Our Sleeve Wrappers are available in a wide range of size capabilities and configurations from manual feed to fully automatic with collating. Speeds generally decrease between trayed (or cased) product and untrayed product.